Stellenbosch is a historic suburban town, with interesting little galleries, an alfresco cafe culture, and proximity to amazing wine estates – all under an hours drive from the Mother City of Cape Town. Blessedly lush, even during dry-spells, Stellenbosch provides visitors the opportunity to experience a bit of the famed Cape Wine Route, before arriving at the luxurious, owner-managed pocket of paradise, with the airs of a gated community. 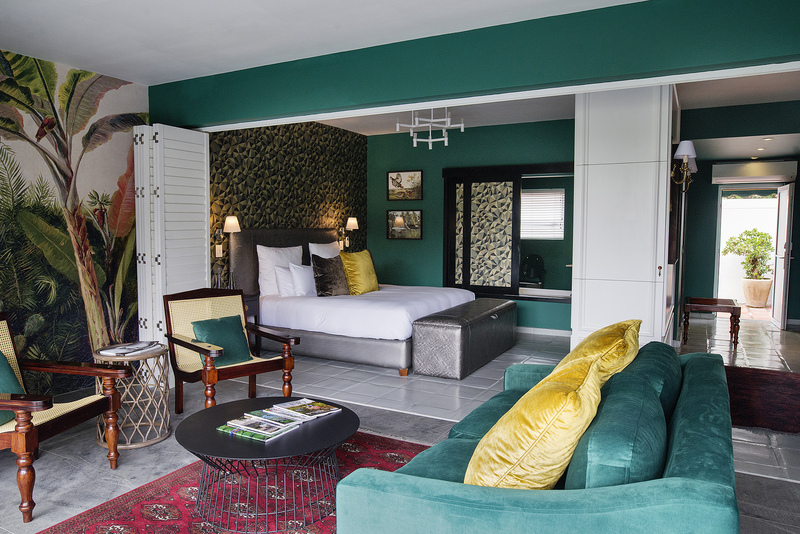 Majeka House is a 23-room 2-storey boutique hotel & spa, managing the incredible feat of providing each guests with an indisputably gorgeous enclave of privacy – with some of the most high-spec finishes, and a whole lot of character. Check-in is a warm and succinct process, while the journey to any of the rooms, is a lesson in walking away from your stresses (and into relaxation) as you patter passed the hotels beautifully manicured towering trees and shrubbery. You would not be too far off, to be reminded of the French Riviera, when you see the boutique hotels white facade, emerald-green awnings, and petrol-blue loungers. Each room and suite is individually designed to have a unique and beautiful interior – whether in color or simplicity, and even a combination of both. At Majeka House, there are: Premier Collection rooms, Garden Alternatives, Mountain View selections, and the poolside choices. Florida motel visuals never looked so chic, once a guest enters my favorite of the hotels suites: an indoor space with open-air living, and well stocked amenities. One is immediately torn between: luxuriating in a roomy bubble bath, while observing (through the patterned screen separating bathroom from bedroom)the rest of the jewel and earth-toned room bedecked in tasteful Jacquard wall prints, perhaps throwing oneself on the plush bed for a lie-in, or dive-bombing into the private pool right on the suites private patio. Majeka House provides guests with access to a secure spa, jacuzzi, gym, award-winning restaurant, and a pool. Guests can enjoy views from many corners of the stunning boutique hotels corners, because the building does not mess with the suburban skyline, and view of the spectacular wine estates in the surrounding area. Facilities which cater to the Differently-abled, as well as families, also elevate the regard I have for this hotel. Full Klaas in Session Review available by clicking here.